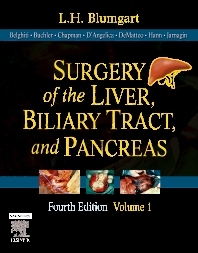 This 2-volume reference, edited by a panel of experts and featuring contributions by many leading authorities, comprehensively covers the cutting edge of research, teaching, and practice in surgery of the liver, biliary tract, and pancreas. This resource covers anatomy, pathophysiology, immunology, molecular biology, genetics, diagnosis, and treatment. Richly illustrated, it is accompanied by a DVD with detailed video clips of laproscopic procedures, effectively allowing you to use it as an operative atlas. Covers pathology, diagnostics, surgery, and non-operative intervention all in one text, to give you a single, comprehensive reference. Offers step-by-step procedures, extensively illustrated with over 200 operative line drawings. 38. Cholecystolithiasis and stones in the common bile duct: which approach and when?